This entry was posted on July 13, 2015, in Czech & Slovak Republics, Destinations, Slovak Republic and tagged Bratislava, Slovakia, Travel, Travel Public Relations. Bookmark the permalink. Bratislava is often little more than a blip, relegated to a half-day on a tour or riverboat itinerary. But for travelers who enjoy exploring nooks and crannies, the city is worth at least a full day or two to truly appreciate. Located on the Danube, Bratislava is the largest city in the Slovak Republic, and is easily reached by bus or train from Vienna or Prague. From Vienna, it’s only one hour, while from Prague the city is approximately 4 hours by bus or train. Unless you arrive with a tour bus or by river boat, you will be confronted by the city’s shabby bus or train station, both sorely in need of an overhaul. But don’t let these first impressions fool you. 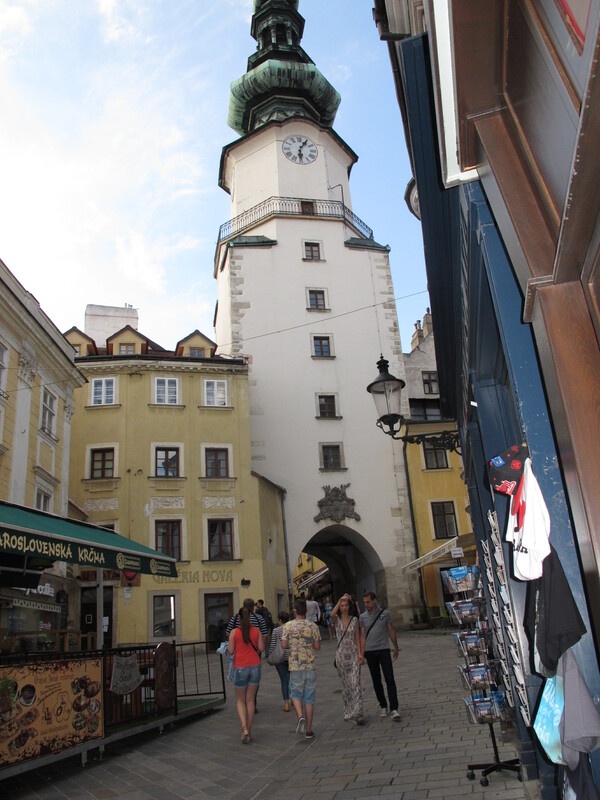 While substantially smaller than Prague or Vienna, Bratislava’s Old Town has a charm all its own. Yes, during the season the cobblestone streets of Bratislava are overrun with tour groups taking selfies of themselves with some of the whimsical statues popping up behind a park bench or underfoot. Still, the city is well worth a visit, even for the tourist-averse traveler. Since the Old Town does cater to tourists, English is widely spoken in restaurants, shops and hotels, so it’s easy to get along. You can spend time wandering the streets, shopping for souvenirs, or enjoying a coffee and pastry, beer or wine at many of the Old Town’s cafes. Restaurants are nonsmoking indoors, but, unfortunately, smoking is still permitted in outdoor cafes and bars. Restaurants satisfy many types of budgets and food lovers. You can find a slice of pizza for 1 euro, try a typical Slovak dish, or select from Viennese-style, South American, Sushi, fish, and more.